My daughter, Libby, doesn't like potatoes. I know! Isn't that crazy? The only way she'll eat them is if they're french fries (of course!) or roasted. Since french fries aren't the healthiest potato option, we eat the roasted potatoes every few weeks. I usually roast them in the oven, but making them on the stove top is quicker! Here's a simple stove top recipe from Cook's Illustrated. I also like to add about a teaspoon of rosemary. If using small potatoes (1 1/2- to 2-inch diameter), halve each potato. If using medium potatoes (2- to 3-inch diameter), quarter each potato to create 3/4- to 1-inch chunks. Rinse potatoes in cold water and drain well; spread on clean kitchen towel and thoroughly pat dry. Heat oil in heavy-bottomed 12-inch nonstick skillet over medium-high heat until shimmering. Add potatoes cut side down in single layer; cook, without stirring, until golden brown (oil should sizzle but not smoke), 5 to 7 minutes. Using tongs, turn potatoes skin side down if using halved small potatoes or second cut side down if using quartered medium potatoes; cook, without stirring, until deep golden brown, 5 to 6 minutes longer. Stir potatoes, then redistribute in single layer. Reduce heat to medium-low, cover, and cook until potatoes are tender (paring knife can be inserted into potatoes with no resistance), 6 to 9 minutes. 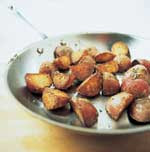 When potatoes are tender, sprinkle with salt and pepper and toss or stir gently to combine; serve immediately. Oh yum!!! I need to go grocery shopping anyway!